Alice Mabel Weir was born in Kenora, Ontario, 1903. Her father, William A. Weir, was a banker who helped open the first Imperial Bank in Kenora. The Weirs moved to Winnipeg in 1910, where her father became the manager of the Clearing House. Her career in dance started when Weir was in Quebec City. After moving to Winnipeg, she continued studying ballet as well as other performing arts, including piano and violin. Weir started teaching ballet when she was 18 years old. Her parents supported her in this endeavor and converted space in their home on Wardlaw Avenue to accommodate her ballet school. The living room and dining room of their home were transformed into her studio. Weir’s mother became her greatest supporter, creating costumes for her students’ recitals. Alice taught dance because of a passion for dancing. She travelled to study with some of the great contemporaries of the time like Leon Leonidoff, director of Radio City Music Hall (New York). She also studied in Paris and London. Alice and her pupils performed at different locations throughout Winnipeg, putting on recitals at the Royal Alexandra Hotel, the Walker Theatre, Eaton’s Grill Room, and the Winter Club to name a few. 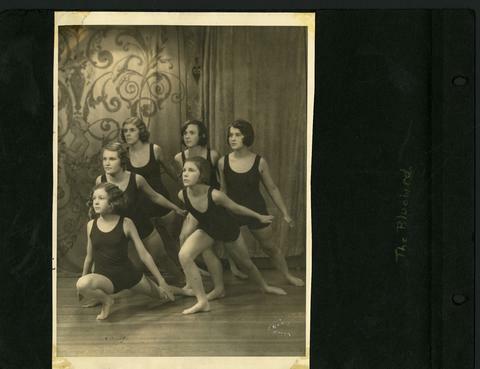 In 1927, Weir started dance classes in Dauphin, Manitoba. In 1928, she moved her Winnipeg dance studio out of her parents’ home to McMillan Avenue. She married Julian A. Robins in 1932 and retired from teaching the same year. They had six children together. She died in 2003. Researchers are responsible for observing Canadian copyright regulations.